58 • October 2014 • S I G N & D I G I T A L G R A P H I C S Wrapping Over Windows Tips and tricks for a successful window wrap Charity Jackson is co-owner of Visual Horizons Custom Signs based in Modesto, California. She has been in business since 1995, and has worked in the sign industry for over 20 years. You can visit her website at www.vhsigns.com. B y C H A R I T y J A C k S o N Let's Talk Shop eliminate window graphics if it created blind spots. Of course we still do cut-vinyl graphics and solid vinyl on windows for some applications, but perforated win- dow film allows the coverage and the visibility that most people are looking for. While benefits outweigh any negatives, be sure that you do mention to the customer that perforated window films have a shorter life span than regular graphics and may need to be changed out at least once during the life of the wrap. You will also want to mention that the window areas will appear slightly different than the other graphics because of the film perforations. The graphics will appear somewhat darker, especially on images with a white background. 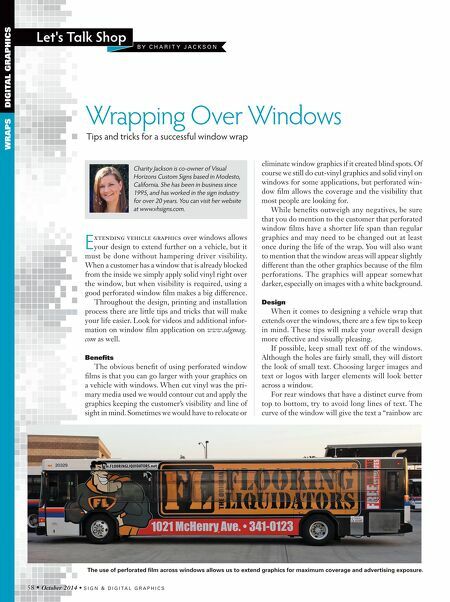 Design When it comes to designing a vehicle wrap that extends over the windows, there are a few tips to keep in mind. These tips will make your overall design more effective and visually pleasing. If possible, keep small text off of the windows. Although the holes are fairly small, they will distort the look of small text. Choosing larger images and text or logos with larger elements will look better across a window. For rear windows that have a distinct curve from top to bottom, try to avoid long lines of text. The curve of the window will give the text a "rainbow arc E xtending vehicle graphics over windows allows your design to extend further on a vehicle, but it must be done without hampering driver visibility. When a customer has a window that is already blocked from the inside we simply apply solid vinyl right over the window, but when visibility is required, using a good perforated window film makes a big difference. Throughout the design, printing and installation process there are little tips and tricks that will make your life easier. 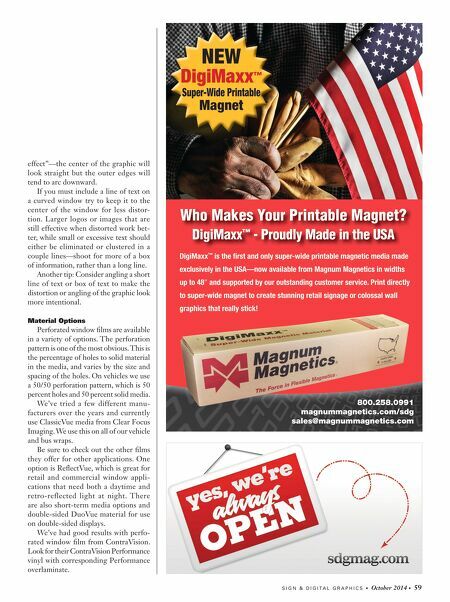 Look for videos and additional infor- mation on window film application on www.sdgmag. com as well. Benefits The obvious benefit of using perforated window films is that you can go larger with your graphics on a vehicle with windows. When cut vinyl was the pri- mary media used we would contour cut and apply the graphics keeping the customer's visibility and line of sight in mind. Sometimes we would have to relocate or WRAPS DIGITAL GRAPHICS The use of perforated film across windows allows us to extend graphics for maximum coverage and advertising exposure.